After saying farewell to the Feral Sea dogs, or FSDees-similar to FBeyes (fierce beavers with night vision)-the last week in Tonga was spent doing maintenance on the continually, perplexing Lord Vader. An electrical leek had produced vast amounts of rust on the keel (the top of which is a stainless steel diesel tank which would, if left, eventually fizz away) and we were not sure where it was coming from. An electrician came to visit, after we had lured him in with a couple of jars of honey, and came up with some temporary solutions with Darth, the Owl. The boat would be ok… for now. When not filling the fuel tanks, shopping for fruit and vegetables, collecting water and preparing the boat for sea some fun was had. Stormy, the cat (stormy by name, stormy by nature, has had no dealings with anyone called Donald) had to be rescued after an attempt at circumnavigating Neaifu on her paddle board, Princess paddle Leia, when the wind picked up. Staring haughtily down into the depths at black and yellow polka dot stingrays which looked like kites she failed to notice that the breeze had changed and drifted languidly into the farthest reaches of the bay. Once rounding the head of the bay and possibly an hour or so paddle away from Darth Vader the sea had picked up into a rough chop. The breeze being almost impossible to paddle against the Owl found her on her knees furiously not going anywhere at all. A proud Owl was invited ‘on stage’ after winning the final and fourth ‘in harbour’ race of our stay. During the race the cat had to take a dive to rescue a VHF radio which the owl had flung overboard, but nobody in the race committee (one man and a dog) seemed to notice. The crew onboard this week were two Russians who had fled the brutal winters and hard life of their home town and were hiding out here in the tropics. They entertained us with their rich and strong accents and willingness to sail. They had never sailed before and had a week before brought a small boat. The owl promised to take them sailing on their own boat, to teach them the ropes, but we never saw them again. The final night was spent having dinner in the home of the South African electrician and his wife. The electrician being a boat handy person extraordinaire, bee catcher and baker and his wife being the local ‘untrained but perfectly capable and much needed’ vet on the island. Their house was filled with smells of freshly baked bread, a Jurassic park of moths on walls and floors, a dog with two wonky legs, South African artwork, a foal in the field and a hive of bees at the bottom. We sat on plastic chairs on their porch under electrical light and they told us stories of the ex-patriot and Tongan characters in the local community. It is is intriguing to find out what draws people to remote spots in the world and how their lives are lived in amongst an odd community of locals, drifters, dreamers or the most practical. We also talked about the feral nature of the current world and how their homes in South Africa have become more dangerous. It is apparently something all sailors talk about when far away and drifting around the Pacific is the collapse of the present day world. The day for departure had come and it was time for the Owl and the Cat to explore elsewhere and say some goodbyes to the friends they had met. The Owl, had ‘Greesed the Spigit’ which he told the Cat one must do regularly -Owls do have an odd way with words- and declared it was time to go. After clearing customs, a lengthy wait as a morning to lunchtime meeting was in progress, they pushed off from the wharf and waved goodbye to a boat full of Italians. The Italians had melted over the sight of Darth Vader and declared their love and admiration at her marvellous beauty. The Owl was so proud, being a lover of dodgy Italian cars, I think he is still beaming now. After this declaration the Owl and the cat waited patiently on the dock as the customs and immigration, health and bio security came and went in a succession of small boats over a period of four hours. The next duty was to get something to eat ashore as supplies were low and stale bread and cheese was not enough to sustain them. 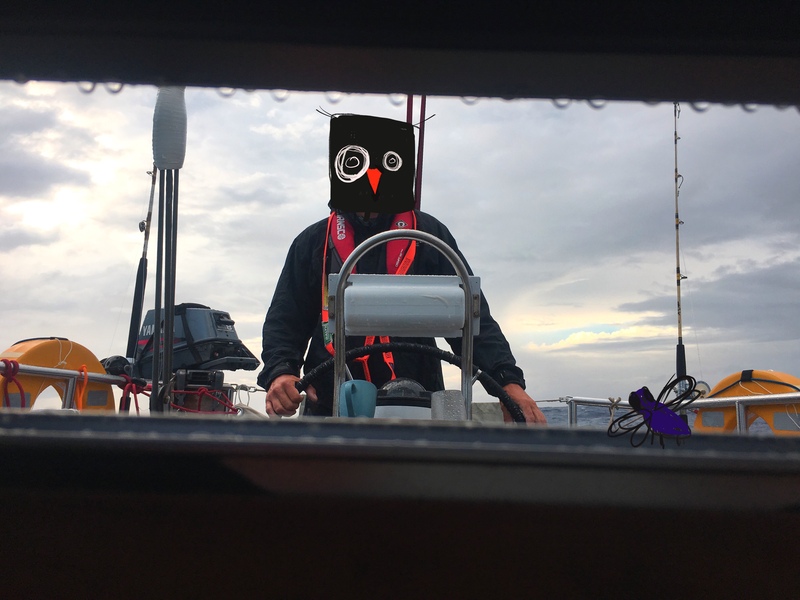 The Owl moored the boat in the narrow channel where they would have to wait for their cruising permit for the next 5 days and the cat visited the hospital to pay the health fee. The hospital seemed empty and no sick were to be seen just nurses and doctors in softly lit corridors who seemed to be engaged in some playful punching shoulder game. The health administrator had been on a very long lunch break and returned with a certain shyness or realisation she had been caught out. A petite Indian Fijian women wearing a ruffle edged blouse, pearls and pink lipstick. Her office was filled with plastic flowers in pink vases and ornate lace curtains. Every movement she made was tiny and delicate and pink, the cat felt dirty and heavy in comparison after having been at sea for three days. That evening the Owl and cat walked through the vibrant town. Tomorrow was Constitutional day, a national holiday and much bustle at last minute shopping and joy at a day off- much coming and going, playing and chatting in the streets. Bright pink, green and orange painted buildings, some brick some wood and wonky shacks. Brown happy faces in bold floral clothes and the smells of incense, curry, pineapple and sulphur, clouds of volcanic steam evaporating at the waters edge. The ferry was departing for Suva on the main island and passengers waited as silhouettes on the wharf as a sunset made for giants burnt out their features from behind. The Owl and Cat knew in the coming days some decisions must be made for returning to New Zealand but for now their weary bones soaked in the last of the dying sun and heads happily went down like diving bells into their pillows.